If you have a good grasp of general knowledge and love playing quizzes then why not try earning from them. You can do them on the internet, in pubs, at home doing competitions and even on television. There are many websites on the internet where you can play trivia quizzes online. An example is the Get Me A Ticket website. Most offer prizes as a way to entice you to register. Subjects include Big Brother, the World Cup, Television, Films and Sports, etc. These make their profit from adverts and you may have to put up with banner ads in between answering questions. They also ask for an e-mail address so that they can add you to their mailing list and send you adverts and offers. You can get round this by using a specific e-mail address just for this purpose. A hotmail account is useful for this. The disadvantage of this is that you will have to check this account for winning e-mails. Prizes are usually sponsored and can be quite good and often include cash. There are real winners and most websites have a page where they publish the winners names. The quiz answers tend to be easy to begin with and get progressively harder. Bear with them and take your time to answer the quiz questions to get a better chance to win the free prize. Some play trivia online sites even have wild card prizes that will award someone who gets to a certain position for that day. This could even be set to the person with the lowest score. Other quiz websites will allow you to take them throughout the day or to return several times a week and build up points. At the end of a set period, such as a month, they will award the top scorers. The chances of winning are probably a little bit better than those given to normal internet competitions because there is a little bit of skill and knowledge required. They are fun and general knowledge buffs will like the challenge of beating the computer and you could win. Entrants to pub quizzes will pay a small fee to enter and get a quiz sheet. This is pooled together and awarded to the winner and sometimes a lesser prize to a runner up. It is normal to have a team, usually of four people. The advantage of play quiz games at the pub is that more minds usually mean more correct answers - or more arguing over who thinks they have the right answer. The disadvantage is that the more people there is in the pub quiz means a lesser share of the prize cash. It can be a bit of a costly when you have to buy a round at the bar and even if you win your team may drink away the profits. However if you enter them for a laugh and a night out then you are still a winner. There are people who will travel around different pubs and bars entering them purely for profit. Owners don't often like these entrants - they don't usually join in the fun and don't buy many drinks. Their aim is to win, take the winnings and move onto the next pub quiz. There are even stories of publicans and landlords who ban such well known trivia professionals. They consider that locals deserve to win and that they take the fun out of events. They are great fun, a social event and winning them will pay for a great night out and maybe a bit of change. There are quiz sheets that you can fill out at home and hand back to be judged for prizes. Common providers are charities looking to raise funds for their good causes. For instance they will print out a quiz sheet and sell it for say £1. They will then award a percentage of the sales to the prize fund. So you could win say £100, with runner up prizes of say £20 and £10. If the charity sells 200 of them they will have incurred minimal costs of paper and ink and the time spent for someone to design them and print them out. Volunteers usually sell them to friends and family. So the charity makes £200 less the minimal costs which gives them a profit of about £60. They provide a bit of fun, three winners get lucky and people help the charity finacially. Other opportunities could be in competitions from magazines and newspapers and even general knowledge crosswords. These usually have cash prizes of anything from £10 to £500. The advantage of filling them out at home is that you can take the time to research the answers from your reference books or the internet. There is normally a time limit to play quizzes but you will have enough time to do the research and fill the form out neatly and post it back or hand it to the quiz master. Television quizzes is where the higher values are - especially if you can get onto a programme like Who Wants To Be A Millionaire. You will need to be comfortable answering with a live audience watching your every move and listening to your every word. They are worth the stress through - winnings can range from hundreds, through to thousands of pounds. There is even the chance of winning the coveted million pound jackpot. 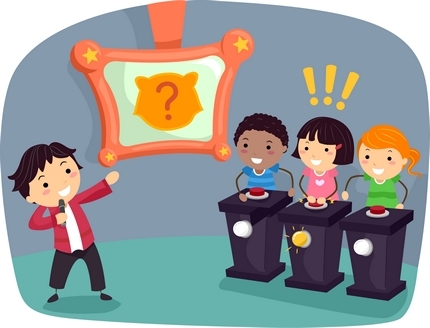 There is more information and advice about quiz and game shows on the be on TV game show page. I am unsure of the tax implications of winning. Prizes for holidays, cars, games, DVDs, etc are probably not taxable but cash prizes won may have to be declared to the tax office on your income tax self assessment return. I would recommend phoning your local tax office for advice if you win. Take part for prizes but above all do them for fun and to challenge your general knowledge and to learn.